For today's post I thought I would share a wood album that I made about a year ago. Like any of the project that I share on my blog, if the stamps are no longer available, you can always replace them with stamps that are on the market now. This project is very easy to create and a great way to add wood in your project if you're afraid to stamp directly on the wood. When I first began stamping many years ago, I loved making projects with wood products but I was always a little afraid about stamping right on my wood piece. What if I mess it up? How would I ever begin to fix it? Well, I can say that I no longer feel that way and I have learned many ways to fix problems when stamping on wood simply through trail and error. Letters & Time by Stampington & Co. Step 1. Remove screws from journal. 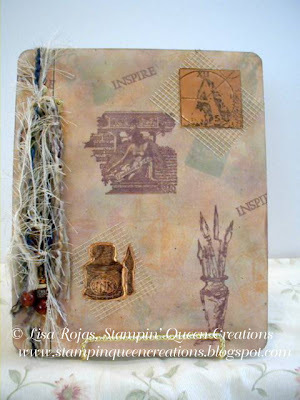 Apply spray adhesive to wood journal and cover with mulberry paper. Using Direct to Paper technique, apply inks to front, back and sides of journal. Put journal back together. Step 2. Stamp images randomly to the front of the album using the chalk-finish inkpads. Spray front and back of journal with sealer. Stamp two images on the copper sheet with black pigment inkpad. Emboss with clear powder and melt with heat tool. Step 3. Cut metal images out with scissors. Cut two pieces of Magic Mesh slightly larger than the metal pieces. Lay Magic Mesh on journal and adhere metal pieces with The Ultimate! glue. Wrap assorted fibers around the end of the journal and add beads. Thanks so much Patti. I'm glad you like it.! Thank you Jan! I appreciate it! !